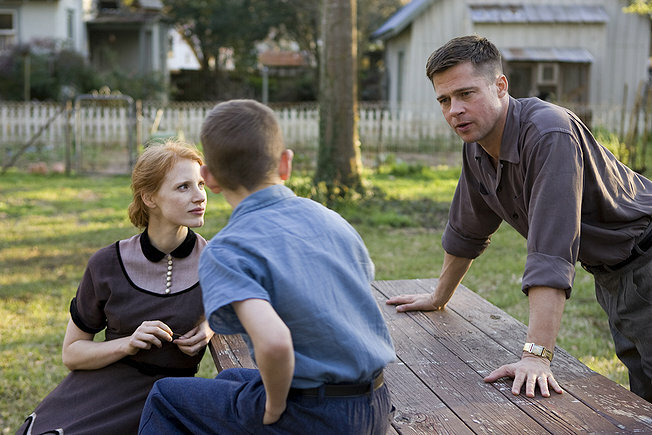 If you are familiar with Terrence Malick, and you’ve seen the select few movies he’s made: Badlands, Days of Heaven, The Thin Red Line, and The New World, you know that Malick often gets artfully distracted in making his films. You will see stretches of a movie preoccupied by nature, likely with voiceover asking questions or pondering everything from a character’s actions to the meaning of life. I think The Tree of Life is the movie Terrence Malick has always wanted to make, not having to concern himself with much of a plot, and straight up making a slow-montage of beautiful images and poetry. In general, I don’t like movies that don’t have a plot. One exception is Lost in Translation. Sofia Coppola’s movie is constructed in a way that evokes just the right mood. I can pick up that movie anywhere and watch it to the end. It’s images, a great soundtrack, and of course, Bill Murray at his best and Scarlett Johansson at a level I’m not sure we’ll ever see her at again. The Tree of Life is more abstract than Lost in Translation, but it nails down that dreamy, immersive feeling that puts viewers in a trance. The movie’s plot is basically about three young brothers, Jack (Hunter McCracken), R.L. (Laramie Eppler), and Steve (Tye Sheridan), are coming of age during a time when their family, led by their father Mr. O’Brien (Brad Pitt) and mother (Jessica Chastain) are running into tense times. Mr. O’Brien appears to want to do everything for his family that he can, but like many in life, runs into disappointment at almost every turn, and a level of boiling frustration enters his family interactions. He wants to turn his boys into men, he’s a disciplinarian and often scary in his anger, but falls short of physical abuse. His wife is the counter to her husband, very sweet, playful, and perhaps a little lacking in doling out discipline. Somewhere early on in the film, we find out one of Jack’s brothers eventually dies at the age of 19, via telegram to mom, by phone call to dad. We see a much older Jack (Sean Penn, in likely his smallest starring role ever) talking to his father about how he thinks of his dead brother all the time. We don’t know exactly how the brother dies, but the context clues point towards Vietnam. We won’t see older Jack again until the end of the movie. We see the younger Jack trying to cope with a borderline violent father by going out with the wrong crowd of kids and experimenting with vandalism, what happens when a frog meets a firework, and curiosity concerning lingerie. We see an odd dynamic in how the kids view their parents. Mom is definitely the fun one, the one you want to love, but the kids have an odd disrespect towards their mother because they feel like she allows dad to walk all over them. And even though dad is a bit of a meanie, the kids welcome him home everyday, showing that respect may be more valuable than love when it comes to parents and their kids. The movie isn’t saying it’s right, but it comes off ringing all too true. The scene that probably gets the most discussion in this film is the 10-15 minute break where Malick shows the formation of the universe, ending up on a curious scene where one dinosaur decides not to kill another dinosaur. Early in the film, we hear a voiceover talking about man’s struggle between nature and grace. We see basically a mirror image of this dinosaur scene later involving Jack and his father. I’m only interpreting what I think all of this means, but Malick’s movie seems to deny the existence of God, that we came from a violent cosmic force, and that it’s natural for us to want to hurt other living things in the process of making our lives better somehow, but there is some other force (I guess grace) driving our actions and we choose not to give in to nature every time. Malick does turn a nice trick here by making a movie that has very little plot and lots of ponderous stretches, yet fills out a great amount of characterization. Mr. O’Brien hardly ever seems to be around, but you know everything about him, just by the images Malick inserts of him in different situations. You will get lost looking at all the beautiful images Malick puts together here, especially when you are also trying to pay attention to the voiceover, poetic and dreamlike in its presentation, speaking to themselves but also to an unknown “listener” (the audience, to themselves, family, friends…God?). If you’ve read to the end of this review, you know whether this is the type of movie you want to see or not. I think this is one of those movies you can’t review like normal movies. It probably rewards multiple viewings (there really is a lot going on in almost every shot), and a one time look at this movie doesn’t give you the complete picture. But I know after one viewing, I was very intrigued, I wanted to talk about it with others. And I’m not entirely sure that Malick has definitive answers for everything in this film. That’s actually OK. I think real explanations might be overrated when it comes to these questions. I am curious to see this. I recently watched all of Malick’s films again. I still love “Badlands” and “Days of Heaven” and still just don’t care that much for “Thin Red Line” or “The New World,” so due to my aversion to his later stuff I will be curious to see what I think of this. Of course being in the Boro and about to have a child it will probably be DVD before I get a chance. From what I understand, this is kind of his “Breakfeast of Champions” or “Tempest” which would set it apart a little bit from the dreaded “DREAM” Project of most directors I would assume. Great review.